Standard 600x180 pixel teaser advert. Standard 85x85 pixel teaser advert. # Guaguancó - a fast to moderate pace, the rhythm can be complex and sometimes couples dance flirtatiously. The man throws his arm/leg/pelvis in the direction of his femael partner - as if to attempt a sexual touch with her. She in turn entices him, but turns away when he reciprocates by reaching out. 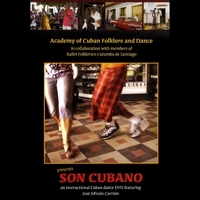 An instructional Cuban popular dance DVD featuring José Alfredo Carrión & members of Ballet Folklórico Cutumba de Santiago. Filmed live in Cuba in 2009; in Spanish with optional English voice-over. ADALBERTO ALVAREZ - EL SON DE ADALBERTO SUENA CUBANO Discounts Apply ! As composer and orchestral director, Adalberto Alvarez completes a musical delivery that shows his excellencies, those coming from his ancient roots, from a musician who came to stay forever. His orchestra is classified as the most important son group of its type in the world, due to its close linking with the Cuban traditional rhythm and contemporary renovation, every year it ranks in a highlight position at the national and international musical scope. ADALBERTO ALVAREZ - GOZANDO EL LA HABANA Discounts Apply ! Gozando en la Habana: Described as an excellent artist in Cuba and abroad due to Alvarez's notable artistic and musical career. Bis Music offers you the 4th album this outstanding musician recorded under this label. The new musical production has all the hallmarks of distinction that has made Adalberto Álvarez deserving in prestige and popularity. This CD is ideal for Casino dancers/ Rueda and continues the ideas from his second CD Para Bailar Casino .